The Virginia State Bar Criminal Law Section has presented its 2016 Harry L. Carrico Professionalism Award to Michael N. Herring. 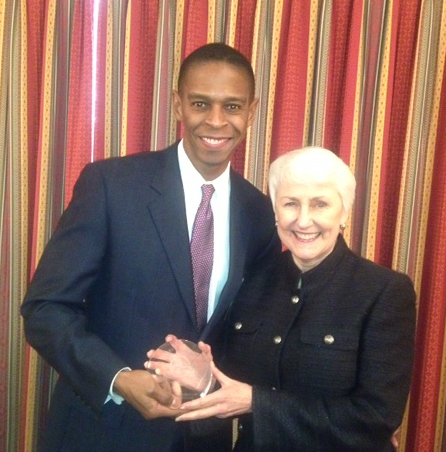 Chief Justice Harry Carrico’s daughter, retired Judge Lucretia A. Carrico, presented the award on February 5, 2016, during the 46th Annual Criminal Law Seminar in Williamsburg. The award, presented by the VSB Criminal Law Section, is named for the former Virginia Supreme Court chief justice who promoted the ideals of professionalism during his forty-two years on the state’s highest court. Herring received his undergraduate degree in economics in 1987 and his law degree in 1990 from the University of Virginia. He started his career as an associate at Hunton & Williams, later joining the Office of the Commonwealth's Attorney in 1992, where he served as a senior felony trial attorney for violent crimes and narcotics offenses. He then returned to the private sector in 1996 at the law firm of LeClair Ryan where his practice focused on medical malpractice defense and criminal defense. Prior to his 2006 election as commonwealth's attorney, he was a partner at the law firm of Bricker & Herring where he practiced criminal law and medical malpractice law. Herring served as the first African-American president of the Richmond Bar Association in 2005, is a past chair of the Criminal Law Section of the VSB and of the Third District Attorney Disciplinary Committee. He is an active member of various professional organizations, including the American College of Trial Lawyers. He also serves on several government, community, and non-profit boards.